5 Bedroom Terraced House For Sale in London for Asking Price £4,000,000. This imposing semi detached Grade II listed house was originally built by John Dawes in the mid 1800s. The interior has since been sympathetically re-designed by Oliver Burns resulting in cover features for “Real Homes” and “Living etc” magazines. 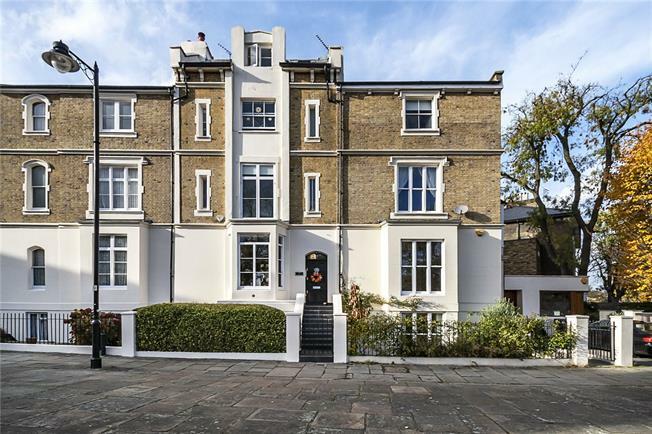 Set out over five floors the raised ground floor boasts a double reception complete with cornicing, fire places and bay window. The lower ground floor offers ample entertaining space with SONOS music system, underfloor heating and Miele appliances. Convenience has not been sacrificed and this floor also contains a utility area, kitchen store and W.C. The dining area flows into a landscaped west facing garden which floods the property with natural light, assisted by the glass ceiling extension. The master suite is on the first floor complete with walk in wardrobe and Villeroy & Boch en suite bathroom with free standing bath, double sink and walk in shower. The stairwell, carpet by Stark Carpets, leads to the remaining four bedrooms, both floors have Jack and Jill bathrooms. “Loxone Smart Home” controls the blinds and heating system and a private garage is included in the sale. With a mixture of Georgian and Victorian housing, residents to include George Orwell, and literary connections to Charles Dickens, The Canonbury Triangle is the most sought after Islington location. You are positioned within 0.1 miles of North Bridge House, 0.2 miles of Upper Street and 0.4 miles of H&I underground.